Oscar-winning actress Lupita Nyong’o carries her CLARINS HydraQuench Moisture Replenishing Lip Balm with her wherever she goes, including to the Oscars! 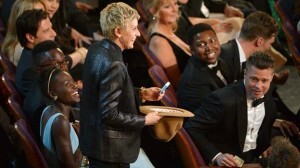 The actress shared the love by giving Oscar host Ellen Degeneres her lip balm while Ellen was collecting money for the infamous Oscar pizzas last night, and Ellen instantly became a fan herself! This hilarious exchange became an instant social media hit, trending on twitter as #lupitaslipbalm, and has sold out almost across the country overnight! Clarins’ HydraQuench Moisture Replenishing Lip Balm, provides intensive relief for damaged lips. Added beauty benefits offer a delicate pink texture to enhance natural lip radiance. The texture is soft and comfortable to pamper dehydrated lips and restore their toned, smooth and healthy appearance any time of year. Active hydrating ingredients to deeply repair lips. Ensures balanced hydration and protects lips all day long. Recreates lips’ perfect “climate”, enhancing a natural sensuous appearance. Works at deeper levels than ordinary lip balms to promote natural healing. Essential Rose Wax, a fine, protective film collected from the surface of rose petals, covers lips with a highly soothing, moisture-protecting barrier. Ceramide 3, identical in structure to skin lipids, helps repair chapped and irritated lips by rebalancing the skin’s natural barrier effect. Maxi Lip Complex encourages Hyaluronic acid synthesis in the dermis, giving lips a fuller appearance. Natural Rice oil extract boosts skin microcirculation and makes lips look pinker.